HMD Global, the home of Nokia phones, gives you more reasons to celebrate Valentine’s Day this year. Enjoy bonding moments and share special music with loved ones with the perfect accessory match for your Nokia Android smartphone! 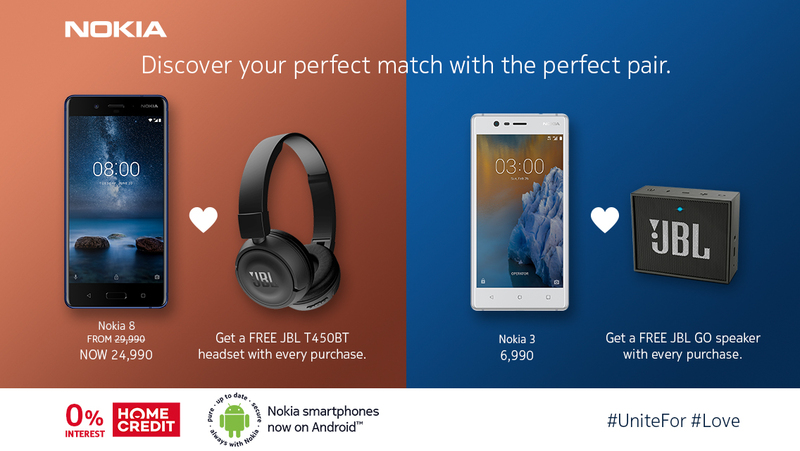 From 1 February to 31 March 2018, get a pair of JBL T450BT Wireless On-ear Headphones worth P3,000 for every purchase of the Nokia 81 or a JBL GO Bluetooth Speaker worth P1,599 for every purchase of the Nokia 32. The Nokia 8, a high-performance and beautifully crafted flagship smartphone, marks three world-firsts: collaboration with ZEISS optics, Dual-Sight technology and OZO spatial 360° audio. The phone’s 13MP front and back cameras featuring ZEISS optics and Dual-Sight mode capture both sides of every story, a feature that does not only brings out the user’s creativity but also allows you share special memories. Featuring front and back 8MP auto-focus cameras, the Nokia 3 can capture precious moments wherever you are. Its precision-machined aluminum frame that exudes durability also means the Nokia 3 is up for any spontaneous adventures. Normally priced at P29,990, you’ll love the Nokia 8 at the special promo price of P24,990 from February 15 to February 283, whilst the Nokia 3 is priced at P6,990. The Nokia 8 and Nokia 3 offer a pure Android experience with premium security. The latest Android OS – Android 8.1 Oreo – is already available for upgrade on the Nokia 8 while the Nokia 3 is powered by Android 7.1 Nougat. Immerse in a whole new level of entertainment experience and share your favorite song with your Nokia 3, blasting every rhythm and sound through the JBL GO Bluetooth Speaker. Likewise, dance and move freely to the beat of the Nokia 8’s OZO spatial 360° audio with JBL Wireless On-ear Headphones. The promo is available in Authorized Nokia dealers nationwide. JBL items may be claimed until 15 April 2018 from the dealers where the smartphone was purchased as long as the official receipt date is within the promo period. With the extended tie-up with Home Credit4, the Nokia 8 may be availed at 0% interest for 12 months and the Nokia 3 at 0% interest for 6 months.